Business Insider/Ed MaggioBadoo CEO Andrey Andreev. The tech CEO doesn’t like to spend over 30 minutes in a restaurant if he’s there for lunch – or over an hour if he’s having dinner with friends. Walk into the kitchens at Novikov in London at 11am and the wall of heat hits you as if you’ve stepped off a plane in a tropical country. It’s the hour before lunch service begins, and large pots of water are simmering on industrial hobs, while staff are eating their own lunch before the chaos begins. Andrey Andreev, however, wants to cook. He’s in a borrowed chef jacket, and he’s keen to show off his cooking skills. The chefs say the kitchen isn’t ready yet, so we walk upstairs to where the restaurant has displayed a collection of freshly caught sea creatures. Andreev taps some of the creatures, which causes them to alarmingly spring to life. It’s a strange sight, watching this Russian dating app billionaire impatiently tapping on sea creatures while he waits for the kitchen to be cleaned. Forbes hasn’t estimated this writer’s net worth at $US1.5 billion (£1 billion), as it has done for Andreev, so I decide to give it a miss. 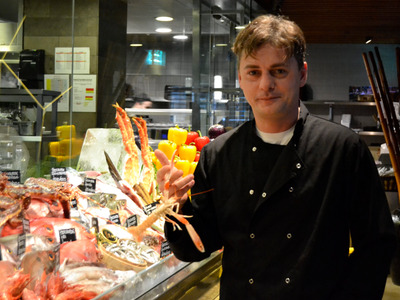 But for Andreev, food is perhaps his biggest passion. In fact, it’s so important to him that he visits some of the most expensive restaurants in London nearly every day, and has introduced his own recipes at many of them. 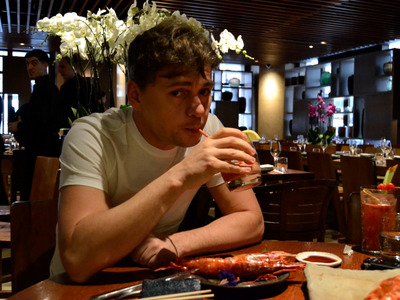 Andrey Andreev doesn’t eat in restaurants in the way that most people do. He doesn’t arrive, read the menu, order some food and wine, and then relax. Instead, he prefers to call ahead so that his food is ready for the moment he walks in the door. That makes sense: Andreev runs a global dating app empire. There’s the core app, Badoo, but it also owns a controlling stake in Bumble, and has revenue share deals with apps including Chappy and Blendr. So he doesn’t have too much time for long working lunches. But Andreev also likes to eat fast when he’s socialising in the evenings. Andreev may not spend much time actually eating in restaurants, but it’s clearly his favourite hobby. He likes to experiment with the menus in Michelin-starred restaurants and introduce some of his own ideas. The Michelin-starred L’Atelier de Joël Robuchon in Covent Garden charges £65 for a five-course lunch, and is the restaurant close to Badoo’s office where Andreev used to eat daily. 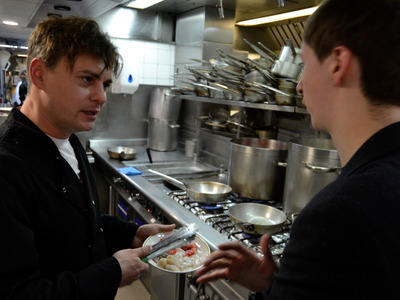 Andreev said that the restaurant’s menu includes an onion soup that he created. He said that it came about when he was bored one weekend. Business Insider/Ed MaggioAndreev looking at his custom sushi. 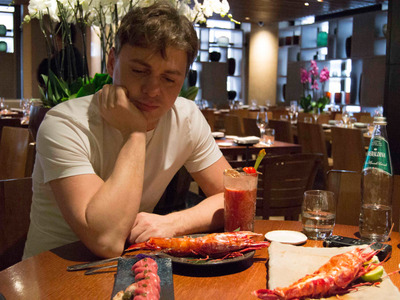 At Novikov, Andreev has designed a series of seafood dishes, including sushi with a reduced amount of rice. “I’m trying to be fit, I’m trying to avoid any carbs,” Andreev said. 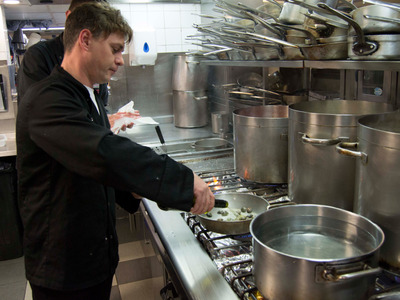 Once the kitchen downstairs at Novikov is clean, it’s time for Andreev to cook some pasta and seafood. His chef jacket sits on top of his daily uniform of a white T-shirt and jeans. Chefs look on as Andreev takes command of a section of the kitchen and sets about cooking some clams. 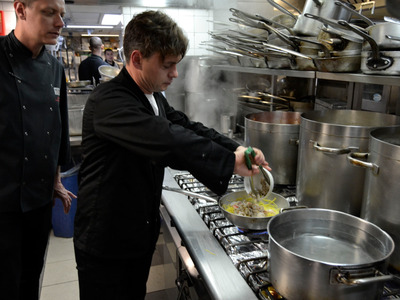 Andreev adds white wine to the clams, and then moves on to cooking some scallops, squid, and prawns to add to the pasta that a chef is cooking next to him. He’s keen to explain to Business Insider each part of the process, and shows us the ingredients as he adds them to the pan. Eventually, it’s time to plate up. The seafood doesn’t take much cooking, and Andreev leads us up the stairs and out of the heat. Business Insider asked Andreev whether he’d like to own his own restaurant. Interestingly, the tech CEO likens his experimentation with food to how he runs his company.